Summary (from the inside flap of the book): Adonis is on the football team. He's dating one of the hottest girls at school. He's a guy's guy. He's tough. Alan is the new kid in school. He joins the Fashion Club, wears lipstick, and wants to be called Alana. The football team can't stand Alan. How can they be real guys as long as he's prancing around school, dressing and acting like a girl? They want to teach Alan a lesson that he'll never forget. Adonis is glad to go along with his teammates...until they come up with a dangerous plan to publicly humiliate Alan. Now Adonis must decide whether he wants to be a guy who follows the herd--or a man who does what's right. 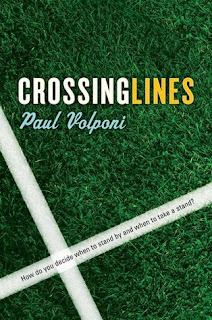 Review: Paul Volponi has done it again! He is SO GOOD. 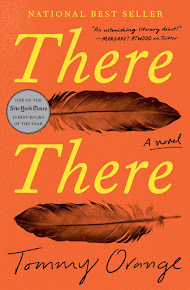 He is a master at creating stories that are believable, uncomfortable, and make the reader ask what he or she would have done in the same circumstances. Adonis isn't your typical YA lit football player (all dumb and nasty, not a great stereotype, but one that crops up often). He is more thoughtful even though he bends to peer pressure from his friends and teammates. As he does, though, he questions his motives and what kind of person he is if he can't stand up for his own opinions. That's a nice change to see even though he doesn't do the right thing until the very end. Alan is a character we don't see very often in YA lit: he is transgender. At first everyone thinks he is gay, but when he shows up wearing lipstick and then a dress, Alan(a)'s identity is revealed. Volponi handles this well, showing that Alan(a) does have friends, is comfortable with his decision, and can stand up for himself when abuse is hurled his way. I think this book does a great job of dealing with multiple issues without feeling preachy!